The formula “E Pluribus Unum” (from many, one) is the traditional motto of the United States used on seals and coins. Its meaning, however, is much more profound than just uniting different ex-colonies to one nation. It is even deeper than what the ancient Greek philosopher Heraclitus gives as “The one is made up of all things, and all things issue from the one”. The eternal wisdom teachings explain that focussing on diversity, as we do with our analytical minds, makes us lose the sense of oneness. All multiplicity is coming from one source, is being held in existence by the unfathomable background of all and is merging again into the inconceivable oneness – from many to one. Chris Jordan, a photographer and artist, has created a mandala named “E Pluribus Unum”. In the video project realised in 2010, he visualises the many different “organisations around the world that are devoted to peace, environmental stewardship, social justice and the preservation of diverse and indigenous culture” (from the video) by zooming from a detail structure to a great globe of interconnected lines expressing the beauty created by all the goodwill work done on the globe. The video contains a million names of such organisations – Chris explains that it would need to include more than twice the number of names to cover all activities. All these projects seem to be different activities but together they form one unified effort to promote the well-being of earth and of the beings living on it – a great visualisation of oneness done through Chris’ video. 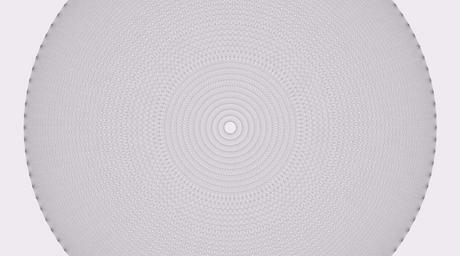 The mandala is constructed around a circle containing 108 equally-spaced points. In Eastern wisdom, the number 108 is explained as containing profound keys to understand time cycles, like 4 x 108 = 432. In many of his artworks Chris visualises complex realities in photos or movies. See also my 2007 blogpost about his activities or about the trailer to his impressive video “Midway” about plastics polluting the Pacific Ocean. His works are intended to raise our awareness to understand complicated relationships by visualising with his “environmental art” the effects of pollution, mass consumption or destructive behaviours. See more on his website or his videos on Vimeo.